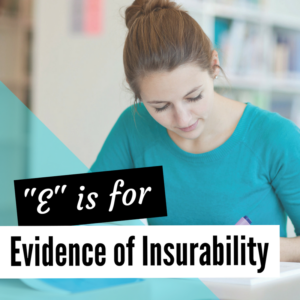 Benefits A-Z: What is Evidence of Insurability? Evidence of Insurability, or EOI for short, is a form that details your medical history and your current health information. It’s required by the insurance company for certain types of coverage, like a life insurance or disability insurance policy. The insurance company uses the information from the EOI to determine if the person is insurable. It can affect whether a person gets approved or denied coverage, and it can also affect how much their premiums are. The EOI will ask for basic information like your height, your weight, and the name of your primary care physician. You will also be asked to disclose any medications you’re taking and what they’re for, and whether you’ve been hospitalized in the last 12 months. What they’re really looking for is any obvious health problems, like diabetes or a heart condition, that would be considered a “pre-existing condition.” If you do have a pre-existing condition, then you may not qualify for coverage. For instance, pregnancy is considered a pre-existing condition. If you’re pregnant and trying to get disability insurance, you may still qualify for coverage. However, your policy probably won’t cover any healthcare costs related to your pregnancy because it happened before your policy became effective. EOI is only required if there isn’t a guarantee issue amount or if someone wants to go over the guarantee issue. This is especially beneficial for people who know they have a pre-existing condition that would prevent them from getting coverage. As long as they apply for a policy at or below the guarantee issue amount, they won’t have to provide Evidence of Insurability. However, it’s important to note that with some policies, this is only applicable if you are signing up at open enrollment. Be sure to consult your benefits administrator if your guarantee issue has any stipulations in regards to open enrollment. The EOI can make or break whether you get approved for coverage. Essentially the insurance company is trying to protect themselves against claims. In case you were thinking to yourself, “Sure I may have XYZ health condition, but it’s no big deal. Why not just leave it off my EOI? I’m still a healthy person.” Think again. Lying or leaving important information off your Evidence of Insurability is considered insurance fraud. If caught, this offense is punishable by jail time, not to mention you won’t receive the benefits from your policy anyway. So be honest and up front about all of your health information, past and present, when filling out your EOI.